Dark Romance: The Monster Within Collector's Edition is rated 3.9 out of 5 by 20. Rated 5 out of 5 by blipi69 from Great Game I loved to Play it. Good graphics and not too easy riddles. I can recommend the game. Rated 5 out of 5 by gamesrgreatfun from A Puzzle Lover's Dream Game! It seemed that I was playing a puzzle every 5 minutes in this game, which was great! I love the puzzles the best! Even better, there was a hard/easy choice for the puzzles which means my grandkids can play and beat most of the easy games. When I play these games with my grandkids, we take turns playing the puzzles. When it's one of their turns, I put it on easy. When it's my turn, I usually put it on hard but it depends on the kind of puzzle it is. This game was very long. It took me several days to finish the whole thing (bonus chapter too). There were tons of puzzles in the bonus chapter also, which was quite lengthy. I liked switching characters, it made the game more interesting and fun. The only part of the game that I didn't love was the storyline because it was so farfetched but it wasn't as bad as some I've seen. The game wasn't filled with devils, demons, ghosts, witches, seances, etc. so that is a BIG plus!! I enjoyed the game and will play it again someday. Rated 5 out of 5 by conja from Switching characters This was a really great game! I love alternating between two characters. 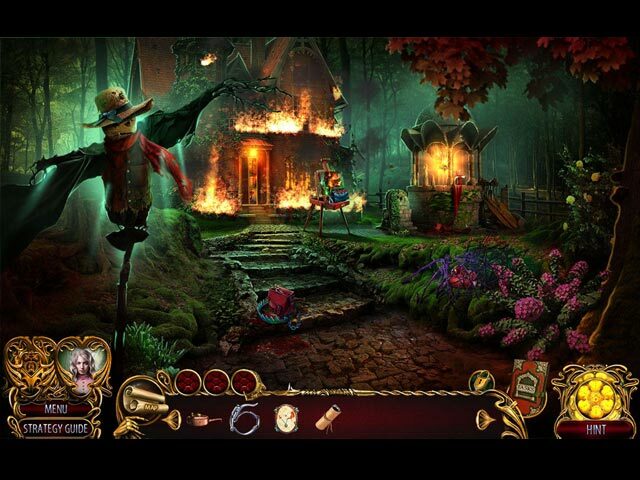 The storyline moved flawlessly with an abundance of things to do and very good graphics. Some mini-games, various H.O. 's and other things to go through. The map works great. You must catch the person who wants to destroy you and all mankind and who wields the magical brushes changing you and Nigel to partial and full animals, turning your friends into animals, creating monsters that you must go through to get to him; who imprisons your loved one giving you the job to free him. By sending each other helpful items both you and your loved one work together to find ways to, in the end, destroy the person, destroy the magical brushes and become normal again. I tended to skip some of the mini games or I would have been there for awhile, confusing myself even more. Now if you are a male, you may write in the perspective of Nigel and have a different point of view as to who did what! Rated 5 out of 5 by domicol from Vey beautiful game And very innovative and insteresting also . Big helps for everyone , it indicate you when there is extra things to find like morpheal object , you can choose between to level of difficultie in minigame . The scenery also is wonderful . Very good game !! Rated 5 out of 5 by MsReddFox from Paint Me Blue I have all of the Dark Romance games and this one will join them. Others have told about the bells and whistles, so just let me say that I really enjoy this game. I like the HO's which are varied, and I always like collecting things; especially since this one shows you if there's any to be found, and some are in the HO scenes. There are morphings to be found and it also shows you if one is in a scene. The only thing that could be better about this game is the rendering of the people. They are stiff looking and when they turn into the 'monsters' they don't look very believable. There are no natural looking movements. They look fine until they move and talk. Having said that, I still enjoyed the game and it's a buyer for me. Rated 5 out of 5 by 1955raven from I WONT BE SITTING FOR A PORTRAIT........ ANYTIME SOON ! THIS STORY OF BETRAYAL AND BLACKMAIL,IS EXCELLENT! A GREAT ADDITION TO THE DARK ROMANCE SERIES!!! Rated 5 out of 5 by biscuitsmama from DO NOT TOUCH THAT PORTRAIT AND IF YOU DO, DON’T LOOK IN A MIRROR Marriage is off to a wild start for newlyweds Sybil and Nigel. The old adage of “beware of strangers bearing gifts” should apply when Sybil receives a gift from a stranger telling her it is a gift is from one of Nigel’s friends. Inside the package is a portrait of Sybil that is indeed “special” but certainly not in a good way. As Sybil takes the portrait in her hands she is overcome and quickly begins a transformation that is sure to unleash the beast within. Who would do such a thing to a kind and lovely young bride? As you play this new game in the Dark Romance series, the Monster Within, you will discover the answer to that question and even more as you find out who is behind this betrayal of friendship. If you are like me and happen to love the Dark Romance series I think that you will find the Monster Within to be a game that you too will enjoy. Yes, for some, the storyline might seem nonsensical but I love the way the developer uses both characters to tell the story using a back and forth interaction between the lovers. Again there are many who love to analyze a game but I am such a game addict that for me unless a game is horribly dark, I play simply for the joy of playing each game that comes my way. The graphics are beautiful and excellent as is expected from this developer. There is a custom mode available and the interactive map. There is an option on the map that you can click that will then show when a scene has collectibles not yet found. You also will find your father’s amulet that will grant you a useful power. Again, I don’t like to give away all of the details of a game because discovery is the most fun. A unique feature from this developer is the inclusion of little circles on the inventory bar that will be open or closed to show when there are collectibles or morphing objects to find in a scene. The Monster Within has an equal distribution of 19 HOPS and 19 Mini-games. 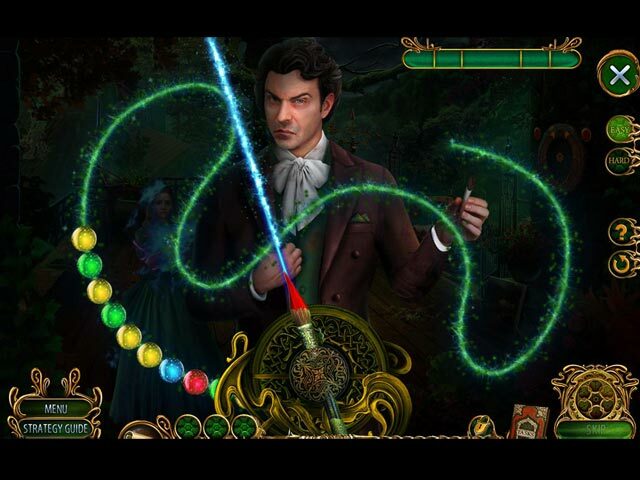 IMHO, the HOPS are very creative and interactive but if you would rather not hunt for objects, there is a Match-3 game. Some of the HOPS do have mini-games included and the one in the first scene is fun. There is good variety in the style of HOPS included in the game with silhouette, list, and storybook types to keep you entertained. The mini-games or puzzles are a lot of fun and many are included in the HOPS as well. The mini-games are familiar but that is not a big deal to me. This developer offers a choice between Easy and Hard when you play a mini-game, with Hard being the default. If you get stuck you can always reset the mini-game by selecting Easy. If you prefer the CE version of a game this one includes 6 Chapters plus a Bonus Chapter and a 50-Page Strategy Guide. 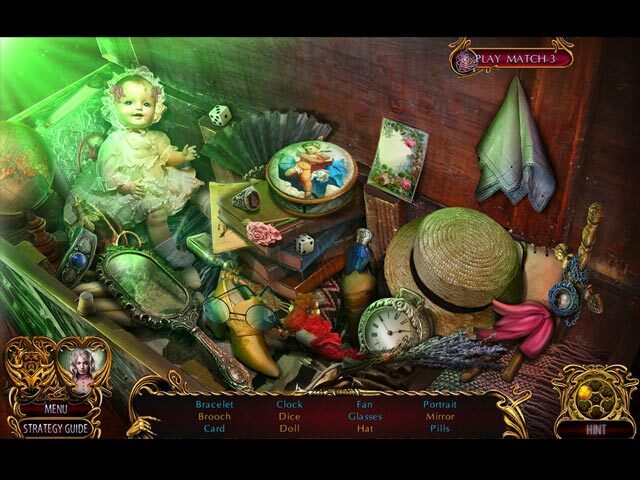 There are Morphing Objects, Collectible Brushes, and Paintings to find. Of course we have Achievements to earn, all with creative names. Other extras include Wallpapers, Concept Art, Music, Movies, and a Menagerie. IMHO, this developer always adds a lot of extra content making the CE version a great value. Since I am a huge fan of fairy tales (I kept several of my favorite collections from childhood) and I love the Dark Romance series. I am a romantic at heart so I really want to bring Nigel and Sybil the happy ending they need to live happily ever after. Even though the game was an instant buy for me, I recommend that you try the demo to see if Dark Romance the Monster Within is a game you will enjoy. Other games in the series include Vampire in Love, Heart of the Beast, the Swan Sonata, Kingdom of Death, Curse of Bluebeard, Romeo and Juliet. Happy Gaming! Rated 5 out of 5 by rainworm from The brush of a painter can be a dangerous weapon We see an artist, making the last strides to a portrait, deforming the woman’s face to a grimace. ‘It worked!’ he exclaims. . Newlywed Sibyl and Nigel Vane are at home unpacking presents, one of them, a portrait of Sibyl. When she takes it up, the picture starts glowing, a greenish light envelopes her and her face deforms partly, looks like a wolf. Shocked, she faints. Nigel seems speechless but at that moment Dr. Benjamin arrives. He is a belated guest to their wedding and he can help Sibyl regain consciousness.. He knows of a similar case. Another woman suffered a similar attack, she now lives apart from public in a cabin in the woods. They agree on bringing Sibyl to her, till they find a cure for that monstrous illness. It seems, cause of the transforming effect would be Basil, one of Nigel’s two best friends from earlier years, who seeks revenge. His father lost his fortune and he blames the fathers of Nigel and Henry for his personal tragedy. You play two roles in this game, as usual for the series. The story is a bit weird, a painter, being able to transform humans into animals, though it has its fascination. We have interesting puzzles with the well-known easy/hard option, more HO scenes, varied in type with the option to play Match-3. Artwork is great, but the game is more slow in pace and we have much dialogue. Rated 4 out of 5 by Majestyx12 from Real Friends don't try to blackmail and kill you! I liked the game. The story is unique. I wanted to know why it was going on and how to stop it. It's a nice looking game. It was long enough with 6 chapters and bonus. When on the bonus chapter I was sick of puzzles and skipped most of them. The hops are nice. You don't switch places in the bonus chapter. The banners are slow and stayed on too long. The collectibles should be more generous. If you only have 15 morphs you know they aren't in every scene. The cursed painting with only 12 are very spaced out. The collectibles go all the way into the bonus chapter. Lots of time you didn't have any collectibles. The 64 brushes lets you buy paint changes to animals in the menagerie. The brushes are only in cut scenes. You have replays on 19 hops, 34 movies and 19 mini-games. You have 15 wallpapers and 20 concept art. The bonus chapter you are the young Melissa and your grandma asks you for help. I would have liked less puzzles and no fool with it puzzles.